Welcome to Wholesale Wheel and Hubcap! Whether you are looking for a factory wheel or hubcap, or to enhance your ride with a set of custom wheels, you can find it all here at Wholesale Wheel and Hubcap. Is your wheel bent, warped, or destroyed? We can replace your factory steel or aluminum wheels at a fraction of the dealer cost. We have an incredible selection of factory wheels in stock every day. A naked wheel is not a pretty site. If you need to replace a hubcap, we've got you covered. No aluminum wheel is complete without its center cap. We have a huge selection of center caps for all types of vehicles. Chances are, we have yours! Looking to spruce up your car or truck without spending a pretty penny? 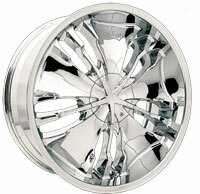 Take a look at our large selection of premium aftermarket hubcaps. The Imposter® Series Wheel Skins are application-specific chrome liners that are tailored to fit most popular steel and alloy wheels. Looking for some tires? We have new, used, and like-new factory take-offs in stock. Still filling you tires with air? Why not start filling them with Nitrogen instead! Save gas, extend the life of your tires, and keep a little more green in your wallet. Looking for something more extreme? We carry a large array of custom wheels tailored to fit your vehicle. Whether you're just looking to upgrade your factory steel wheel and hubcaps or if you're looking to roll with the big boys we've got something for you. Needing to replace those tires on your custom rims? Check us out for your replacement tire needs. We have a huge selection to choose from at prices you can afford. Now that you've got some rims on your vehicle it's time to accessorize! We carry a complete line of chrome door handles, grilles, chrome mirror covers, pillar posts, gas door covers and much much more. Come check us out for all of you accessory needs. Inqueries, questions or just to say hello, feel free to give us a call.